105 mm L/45 MPL C/32ge4 х 1 pcs. 180 Degree Turn Time17.14 sec. Initial HE Shell Velocity780 m./s. 37 mm Flak LM/422 х 2 pcs. T-22 — German Tier V destroyer. The T-22 is a step away from her predecessors and a transition to the hybrid gunboat and torpedo-spamming style of the higher tiered German destroyers. The frontal torpedo tubes from the previous German destroyers are gone from the T-22 on, however she does not yet have the Hydroacoustic Search ( ) consumable that the German destroyer line is known for or the powerful guns that allow her to become a good hybrid gun and torpedo boat. These factors make the T-22 seemingly the low point of the German destroyer line, but this does not mean that the T-22 is a bad ship. She is a tricky ship to handle, but if played correctly she will reap great rewards. While the T-22's guns are mounted on turrets that can turn 360 degrees, her main batteries are overall quite weak. The high explosive does a pitiful amount of damage compared to her Tier V destroyer counterparts which makes her a poor gunboat despite the main batteries' relatively quick rate of fire. Combined with her fragility and relatively low health point pool, knifefights and 1v1s against other destroyers should be avoided unless the enemy destroyer is distracted or on very low health. The torpedoes on the T-22 are quite decent, unlike the main batteries. The reload time for the torpedoes are quite rapid for triple torpedo tubes at 68 seconds, which can be decreased to 61.2 seconds with the Torpedo Armament Expertise captain skill. The quick reload and the decent 7.5km range of the torpedoes makes the T-22 a very good ship to spam torpedoes from stealth. With proper positioning, she can wreak havoc to unsuspecting enemies constantly, and the fast reload may even allow her to stack floods on battleships with Damage Control Party ( ) on cooldown. Playing the T-22 decently requires the captain to be able to be one step ahead of the enemy and to always keep an eye on the minimap. Positioning is key in the T-22; she struggles greatly in situations where she cannot control the terms of the engagement. Always be where the enemy fleet is heading to while trying to avoid detection by enemy destroyers in order to get the best torpedo angles. Once the captain can master this, the enemy team is theirs to feast on. Tied with Nicholas for fastest rate of fire of all Tier V destroyers. All turrets can rotate 360 degrees. Torpedoes are fairly good in all respects. Loses forward firing torpedo tubes her predecessors had. Horrendous ballistics, especially at range. Very short smokescreen duration limits offensive smoking ability. If lacking the Concealment Expert skill, the torpedoes should be upgraded first, as it makes torpedoing from stealth much more comfortable. Otherwise, one could opt for the upgraded hull first. The gun range should be taken last, or even not at all, given how poor the ballistics are. T-22 gains access to Upgrade Slot 3, which offers two decent options: Aiming Systems Modification 1 and Main Battery Modification 2 ( ). The former is recommended if playing T-22 without a captain who has Basic Firing Training and Expert Marksman as commander skills; otherwise, the latter is a better option as the penalty to her reload time is barely noticeable (while the buff to her turret traverse is quite noteworthy). Low-tier German destroyers need skills that allow them to survive longer. Priority Target, Preventative Maintenance, High Alert, Last Stand, Vigilance, Survivability Expert, Concealment Expert, and Advanced Firing Training will all help in this regard. 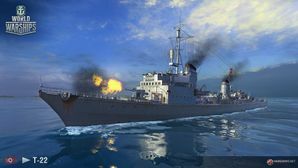 The choice of which signal flags to mount will reflect the individual preferences of each captain, although there are certain flags which simply suit destroyer gameplay better. Captains should mount November Foxtrot ( ) to decrease reload time of consumables and Sierra Mike ( ) to increase the ship's maximum speed. Captains wishing to make their torpedoes more potent should mount Juliet Whisky Unaone ( ) to increase chance of causing flooding, and Juliet Charlie ( ) to mitigate risk to magazine detonation from mounting the former flag. If captains wish to buff their main battery guns, they are encouraged to mount Victor Lima ( ) and India X-Ray ( ) to increase fire chance to HE shells. A Minekaze fails to dodge a torpedo spread. V-22 attempts to shoot down a squadron of aircraft from a dead enemy Bogue. The ship engages an enemy Kaiser class battleship from the safety of smoke. T-22 was the first ship of the Type 39 class torpedo boat completed for the German navy. Unlike previous designs, the Type 39 class ships were constructed for fleet duties. The overall size of these ships was significantly larger than previous designs which allowed for a much heavier armament to be mounted, but this also resulted in a drastic decrease in top speed. The ships of the Type 39 class retained the same triple torpedo launchers used on older torpedo boats and carried a more potent main battery armament to accompany them. Whereas both the Type 35 and Type 37 ships were fitted with only a single 105mm gun, the Type 39 ships had four of these guns. Additionally, these guns were allowed to elevate up to 70 degrees but the lack of high angle fire directors made them ineffective at dual purpose roles. By the time T-22 was completed, there was a much greater need for anti-aircraft defense. As a result, T-22 and the other ships of the Type 39 design were fitted with additional 20mm and 37mm anti-aircraft guns. The radar mountings on these ships were also improved through a series of refits. T-23 at anchor, circa 1943. T-30 at anchor, date unknown. This page was last modified on 13 March 2018, at 16:52. This page has been accessed 42,321 times.